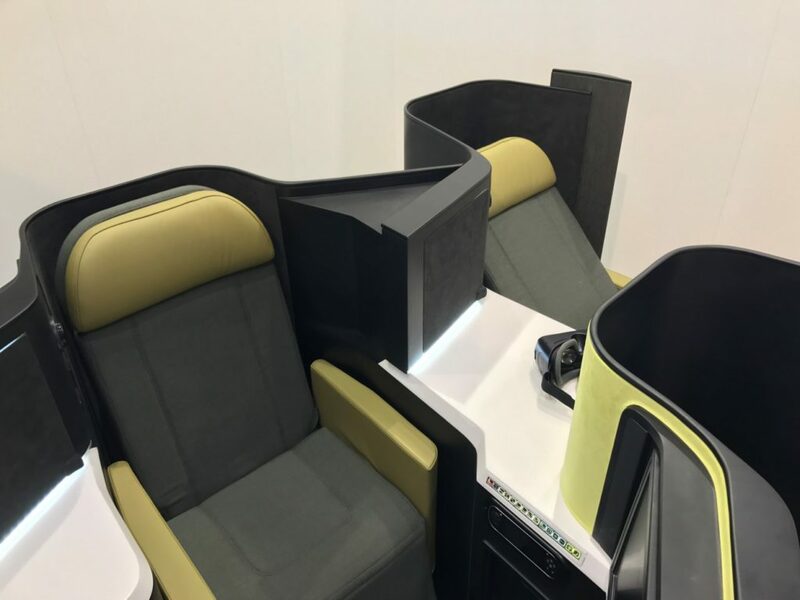 Italian seatmaker Aviointeriors has developed an almost mind-boggling application of its Adagio staggered fully flat business class seat: a five-abreast configuration on a narrowbody aircraft that still offers direct aisle access. Adagio was first unveiled at the Aircraft Interiors Expo (AIX) Asia event in Singapore last year in a fairly standard 1-2-1 (in staggered eight abreast) form for larger widebodies, but its evolution in partnership with design house Tangerine – revealed at AIX in Hamburg – is truly impressive. A 1-1 (staggered four-abreast) narrowbody flatbed with direct aisle access wouldn’t be particularly complex, but the way that Adagio is designed makes the staggered five-abreast concept fascinating, particularly since Aviointeriors is claiming a seat pitch of 43”, seat width of 20”, bed length of 76.4” (6’4.4”), bed width of 26.2”, and ottoman sizes varying from 16.2-18 inches. Much of the benefit comes from the slight offset of the seats, which certainly seems reminiscent of other products (Recaro’s CL6710 in particular). Essentially, on the right hand side of the aircraft the stagger is fairly simple, but on the left it’s a matter of having the window seat offset in order to create a multi-use gangway for the two passengers sitting away from the aisle in every row after the first. On the left-hand side, where the three seats are staggered per row, the benefits are clear for passengers sitting in the window: they pop out via the gangway next to their side table. The centre seats are the next best, with a window over their side table and a passenger between their shoulders and the aisle. These passengers slip out through the same gangway as the window passenger in front of them. The aisle passengers on this side of the aircraft, however, lose out on personal storage given the lack of side table from the passenger next to them. There’s room here for Aviointeriors and Tangerine to figure out options: some kind of over-shoulder storage like JAL offers in its implementation of B/E’s APEX seat? A personal locker at the foot of their seat where the side table would be? It was clear when Runway Girl Network sat down in Aviointeriors’ hidden seating room with managing director and CEO Ermanno De Vecchi that the seatmaker is flexible and keen to respond to airline requests. Apart from the new set of layout of passenger accommodation diagrams (LOPAs, akin to professional-grade seat maps), we asked De Vecchi, what has changed since we first sat down in a mockup last October? Adagio is currently planned to arrive in three versions: aligned or staggered versions of the Adagio flatbed, or a Z-bed style product that Aviointeriors is calling Adagio PE, aimed at the premium economy market, and which De Vecchi says “maintains all the major characteristics of the basic seat”. Offering the same basic platform for two different levels of product is not new — B/E Aerospace’s early 2000s Minipod product was essentially a fully flat bed with at a greater seat pitch and an angled lie-flat seat at a smaller pitch. In the wider industry context of significantly delayed seat production, De Vecchi believes that Aviointeriors’ and his own experience outside aviation will be a benefit. Indeed, with the biggest names in the flatbed business — the former B/E Aerospace (now Rockwell Collins), Zodiac (in negotiations with Safran) and Thompson (bought by AVIC) — all in the process of being purchased or merged, a nimble manufacturer with an innovative product could be attractive to customers.